Inoculate seedlings and established vegetative plants with the highest CFU’s on the market! 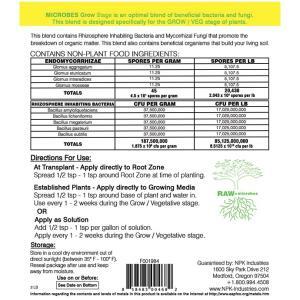 Grow Stage RAW Microbes were created for the growth and vegetative stage of plants. This beneficial group of bacteria and fungi promote root growth and nutrient availability during the growth stage. The individual cultures and final blend are double tested to assure the finest product for building living soil.